idev CMS is a very robust and versatile content management solution that combines usability and scalability into one compact package. This CMS is widely used by small startups to large international Fortune 500 companies all over the world. Vaunted for its vast suite of features, idev CMS is powerful to help small businesses handle their content management needs yet flexible to grow and scale up with your business as your enterprise expand. idev CMS packs a powerful set of tools and functionalities that enable businesses and organizations to find success. The platform is also very user-friendly, with tools like drag-and-drop page builder, asset manager, form builder, and more are built to be simple and straightforward even for the non-technical users. idev CMS highly robust and flexible content management platform designed to help businesses, big or small, B2C or B2B, to address their website need. 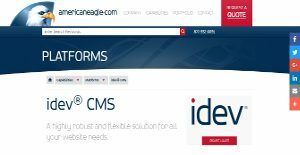 Developed by AmericanEagle.com, idev CMS offers full customization paired with flexibility and scalability that allows it to grow or scale down depending on your business requirements. idev CMS comes with a plethora of tools that will suit small businesses to large international corporations. idev CMS is widely used all over the world, with customers coming from the small business sector to Fortune 500 companies. Versatility, along with scalability, is one of its best features. Offering robust features to take care of the needs of small to large business, idev CMS is also built to effortlessly manage handle multi-site, multilingual, and e-commerce platforms with thousands of pages. idev CMS is unlike other content management systems, as it is built, updated, and implemented by the same people. That means you don’t have to wonder who to ask for support if issues arise or wait for a long time to receive an official update. You’ll never have to wonder who to call if something goes wrong or wait months for an “official” release to upgrade to enjoy the software’s most recent development and tools. While the idev CMS presents users with a trove of intuitive features and functionalities, it’s also a totally developer-friendly solution. Developers and designers alike can add modules, configure layouts and pages, and get inside the framework as required. If you are interested in idev CMS it might also be beneficial to examine other subcategories of Best Content Management Software gathered in our database of B2B software reviews. There are trendy and widely used applications in each software category. But are they automatically the best fit for your company’s unique needs? A trendy software solution may have thousands of users, but does it offer what you need? For this reason, do not blindly shell out for popular systems. Read at least a few idev CMS reviews and consider the aspects that you wish to have in the software such as the price, main tools, available integrations etc. Then, shortlist a few systems that fit your wants. Try out the free trials of these apps, read online comments, get clarifications from the maker, and do your investigation systematically. This exhaustive homework is sure to help you select the most excellent software platform for your company’s unique requirements. How Much Does idev CMS Cost? idev CMS individual and enterprise pricing are available only upon request. Contact the company for payment details and related information. We realize that when you make a decision to buy Content Management Software it’s important not only to see how experts evaluate it in their reviews, but also to find out if the real people and companies that buy it are actually satisfied with the product. That’s why we’ve created our behavior-based Customer Satisfaction Algorithm™ that gathers customer reviews, comments and idev CMS reviews across a wide range of social media sites. The data is then presented in an easy to digest form showing how many people had positive and negative experience with idev CMS. With that information at hand you should be equipped to make an informed buying decision that you won’t regret. What are idev CMS pricing details? What integrations are available for idev CMS? If you need more information about idev CMS or you simply have a question let us know what you need and we’ll forward your request directly to the vendor.